Site Explorer will show information about your site from almost 100 data points we collect, these data points are all important metrics for any technical SEO. You can access Site Explorer under the Site section in the left navigation menu. At the top section of the Site Explorer, you will see some basic information, you can also export all the data from Site Explorer to a single spreadsheet. Below the top section you will see the filter of Site Explorer, allow you to do some advanced filtering of pages that meet certain criteria you've defined, clicking on the arrow button at the right of the box to expand these filter options or use our filter presets by choosing one in the drop down menu at the left. 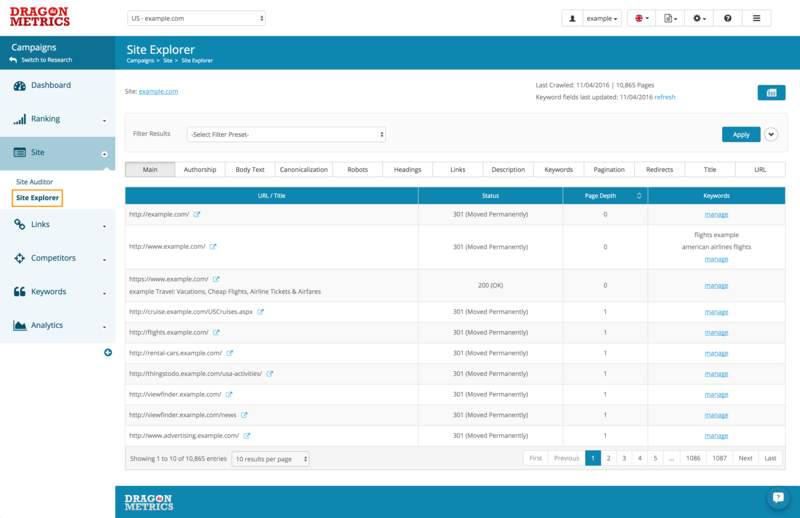 These filters can be incredibly useful if you are auditing a site with thousands of pages. Below the filter section you will see a bar of buttons which you can choose to view data points category, we will discuss data points in a bit. Below the buttons bar you will see a table displaying all the data within your chosen criteria above.